Tom is a trial lawyer practicing complex intellectual property and business litigation. He has extensive experience in Hatch-Waxman litigation on behalf of generic pharmaceutical companies and has handled numerous patent, trademark, copyright and trade secret litigation matters related to various technical fields, including polymer processing, chemistry, metallurgy, pharmacology and animal reproduction, and various media, including print, video and computer software. Tom’s trial experience includes jury and bench trials in jurisdictions across the country, including the U.S. District Courts for the Western and Eastern Districts of Wisconsin, the District of Delaware, the Southern District of Indiana, the Southern District of New York, the Northern and Central Districts of Illinois and the Northern District of Mississippi; the Circuit Courts of Dane, Rock, Dunn and Jackson County, Wisconsin, and Cook and Madison County, Illinois; and the Supreme Court of the State of New York, County of New York. He has also argued before the U.S. Courts of Appeals for the Federal Circuit and the Seventh Circuit and the Courts of Appeals of the States of Wisconsin and Illinois. Defending a Wisconsin county against an action seeking to establish accountability for massive cleanup of coal tar pollution in Lake Superior. A judgment of no liability was entered in favor of the client. Advising a plaintiff in copyright infringement and trade secret misappropriation claim over the design of a turf management machine. Defending a food manufacturer against a preliminary injunction seeking to shut down client’s business based on an alleged misappropriation of trade secrets. After extended injunction hearing, the court ruled in favor of the client. 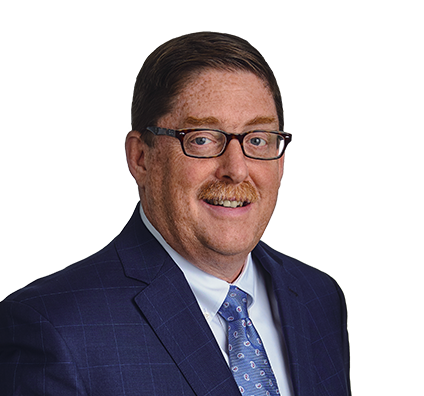 Tom has extensive experience defending and prosecuting all aspects of intellectual property and commercial claims, including investigation, examination and defense of expert witnesses; motion practice; settlement negotiation; discovery management; jury and bench trials; and appellate practice. He also has extensive experience handling patent litigation matters in the Western District of Wisconsin rocket docket. Currently serving as trial counsel representing three of 29 joint defendants, consolidated in Maryland District Court, in patent litigation related to a pre-press printing process. Also chosen to act as defense liaison counsel. Defended Ashland County, Wisconsin, in CERCLA contribution action seeking to establish accountability for massive cleanup of coal tar pollution in Chequamegon Bay in Lake Superior. After a lengthy bench trial, the client was found not to be a covered person under CERCLA, and a judgment of no liability was entered in favor of the client. An appeal was withdrawn shortly thereafter without contribution from the client. Represented plaintiff, a supplier of animal reproduction technologies, in patent and trademark litigation related to agricultural products. The matter also involved simultaneous patent disputes between the same parties in Canada and Germany and trademark disputes in Mexico and China. After favorable summary judgment ruling, the matter settled in all jurisdictions worldwide on terms favorable to the client. Represented plaintiff, a manufacturer of toys and nursery products, in a patent infringement action over patents related to infant drink containers. Settled on terms favorable to the client shortly after the lawsuit was filed. Counseled plaintiff in copyright infringement and trade secret misappropriation claim over the design of a turf management machine. After formal mediation, settled on terms favorable to the client. Represented plaintiff in trademark infringement matter regarding personal services. Settled on terms favorable to the client. Advised plaintiff, a manufacturer of automotive and heavy-duty products, in patent infringement litigation related to vehicle backup viewing systems. Negotiated a business solution for the client. Defended a manufacturer of stainless steel, multi-ply and cast aluminum cookware in a false patent marking case both before and after changes to false marking remedies under the Smith-Leahy America Invents Act. Matter settled on terms favorable to the client after trial and the passage of the Smith-Leahy America Invents Act. Defended national hardware store cooperative in patent infringement litigation related to a secure website for the creation of advertising. Settled on terms favorable to the client. Represented generic pharmaceutical manufacturer in patent litigation under the Hatch-Waxman Act. Settled on terms favorable to the client. Represented generic pharmaceutical manufacturer in patent infringement litigation under the Hatch-Waxman Act. The case was tried to verdict in Delaware District Court. Defended client in a trade secret action claiming disclosure of an allegedly confidential process for manufacturing soy flour in a patent application. Settled on terms favorable to the client. Represented plaintiff in a patent infringement action over a patent related to heat treatment of rotary cutting blades. After favorable claim construction ruling, settled on terms favorable to the client. Defended a manufacturer of container handling systems in an infringement action over patent for liquid container filling apparatus. After favorable summary judgment ruling, settled on terms favorable to the client. Served as trial and appellate counsel representing active pharmaceutical ingredient manufacturer in a judicial patent interference matter. Trial court judgment in favor of the client, affirmed on appeal. Defended a food manufacturer against a preliminary injunction seeking to shut down client’s business based on an alleged misappropriation of trade secrets. After extended injunction hearing, the court ruled in favor of the client. Represented a golf course developer against a claim of trademark infringement and false advertising. Negotiated a business solution for the client.